To be good at it you need to eat, breathe, sleep, love and live it with the entirety of your existence. It’s not a sport for the feint of heart and it will challenge your ability to keep it together upstairs, but that is exactly why it is a gentleman’s game loved by so many. Golf is a one of a kind sport where either you love it or hate it. There are of course various golfers who have displayed a natural aptitude for the game, becoming the sports legends and keeping the hope alive for the little white ball that ultimately sinks in a garden of goodness. The unwavering men behind the little white ball are the sports greatest exports, who from the early stages of the modern game have been pushing the boundaries of golf and setting a standard at which the game is played today. These men are considered pioneers and legends that are now the most successful golfers in the history of the sport. This list of the most successful golfers of all time sums up a list of golfers that have influenced and shaped the modern game of golf into what it is today. The following professional golfers who have been the most successful represent a group capture of the best the world has brought into the golfing mix. Jack Nicklaus also known as the Golden Bear has 73 career victories. Nicklaus has won 18 major golfing championships and has scooped victory in the Masters an astonishing 6 times. What is even more impressive is that the Golden Bear has completed a career grand slam 4 times, arguably making him the best golfer to have ever walk the course. 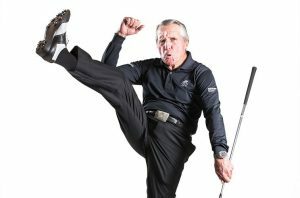 Nicknamed the Black Knight because of his all black outfit on match days, South African Gary Player is the most successful non-American golfer to have ever lived. A big rival for both Arnold Palmer and Jack Nicklaus, Player secured 9 major victories in his career. The Black Knight has won 3 masters titles and 3 open championships. He completed his career grand slam event and he remains the only non-American to do so. Racking up 165 victories on 6 continents in just 6 decades, Gary Player remains one of the most successful golfers in history. Even more astonishing is the fact that Player does not just stick to the golfing world, more volatile than real money online slots he has designed over 300 golf courses, written 7 books and is the proud owner of the Gary Player Stud farm, which is a top thoroughbred race horse farm. Many golfing enthusiasts consider Ben Hogan’s swing the most perfect the sport has ever seen, and he has been referred to as the greatest golf ball striker in the history of the sport because of it. In 1953, Hogan won 5 of the 6 tournaments he entered into, including 3 major championships; subsequently 1953 was declared Hogan Slam. Hogan ended his career on a high with a total of 9 major championships in the bag. Considered as the greatest golfer of the first half of the twentieth century, Walter Hagen won 11 major championships over the course of his career. One of the most successful golfers to ever grace the course, Hagen was the first American to sink his teeth into the cup at the British open championship. Walter Hagen was one of the most successful golfers because of his unique ability to the game from a young age. Hagen went pro at just twenty years old and shortly after very nearly secured a career grand slam, loosing out on the masters title. Hagen won 4 open championships over the course of his career and remains one of the most successful golfers to date.